I saw five dollars on the floor of a Dunkin Donuts today and I spent a good couple of minutes deciding if I should pick it up or not. On the one hand, I just found twenty dollars the other day, which seems like I’ve found my fair share of money for this month already. I should let someone else find the money to rebalance my karmic wheel. On the other hand, I don’t believe in karma and I just recently lost my job, so I kind of need all the money I can get, even five dollars of floor money. On the other hand, if I need five dollars THAT badly, I could just not get an iced coffee and thereby save just about that amount. Then there’s the fact that someone will see me pick up the money. Maybe they’ll think I’m just trying to steal someone else’s money. Maybe it’s their money and they’ll be angry that they see me picking it up. Or worse, it’s NOT their money, but they’ll claim it is and then I won’t have a leg to stand on. So if I do pick up the money off of the floor, I need to make sure no one sees me, because otherwise I might be called a thief and have to give up the money and leave the Dunkin Donuts with my head hanging in shame while all the other customers glare at me in righteous indignation. And while I’m thinking all this, a young woman with a baby carriage picks up the five dollars and I council myself that a woman with a baby needs five dollars more than me and I made the right decision. One of Dylan’s Slightly Drunk Beer Reviews! It’s been a while since I’ve done one of these, because I don’t have much to say anymore. All the beers starting to blur together into one big boozy haze. Since I couldn’t think of anything interesting to say, I decided to leave them alone until I did. And now I do. Since it’s Fall, there are a large number of pumpkin flavored beers out and about. I’m going to review a couple of them, so you know which one is safe to serve at your party this 31st. 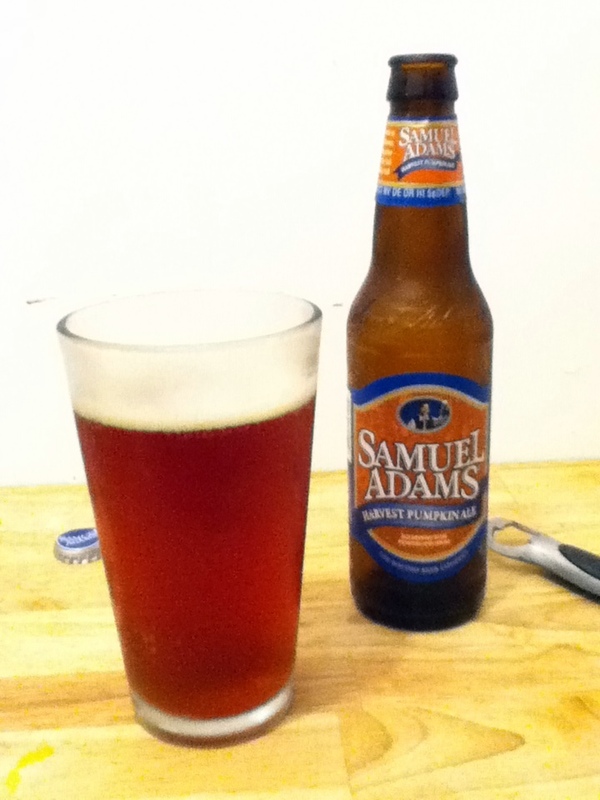 Today, we’re going to start with an offering from Sam Adams, since they’re a local brewery and all. They have a couple of seasonal ales out right now, but the best, by far, is their Harvest Pumpkin Ale. The thing I’ve been loving the most about the pumpkin ales I’ve had is that they’re always a faintly orange color. Beer is often awful pretty, excluding those that are just that sickly, wan yellow color. Like their other flavored beers that I’ve had, the flavor isn’t overpowering. I’m not gagging on pumpkin spice. And the flavor really is less reminiscent of pumpkins then of the spice in pumpkin pie. It tastes like cinnamon and nutmeg and a host of other spices that I can’t identify. It tastes like Fall, in other words. Specifically, Fall just after Halloween, more toward Thanksgiving. It’s not a thick beer, nor an overly bitter beer. It’s more a beer for people who don’t drink beer that often, your hard cider drinkers, for instance. It’s well-rounded, without being too in-your-face with its flavor. This is a good Sam Adams beer. Unlike their Bonfire Rauchbier, which was one of the worst beers I’ve ever had, even including that one raspberry flavored beer I drank that tasted like spoiled yogurt. It’s a beer whose entire marketing revolves around the fact that it tastes like a bonfire and, by god, they deliver. It’s like drinking a bottle of artificial smoke flavoring, if that artificial smoke flavoring had been fermented in a vat of tepid beer for a couple of months. Sam Adams Harvest Pumpkin Ale gets an A, but loses some points because its seasonal companion, Bonfire Rauchbier made me want to strangle kittens it was so bad. I’ve always wanted to go to a horror convention. There are few places where my out-of-proportion love for horror movies would seem normal and a convention for horror freaks is one of them. Luckily for me, there’s a convention right here in Boston. And, by right here, I mean over in Worcester. It’s called Rock and Shock and it’s going to be at the DCU Theater and Palladium between October 14th and 16th. The guest list alone makes me want to squeal. Robert Englund (Freddy Kreuger) and Kane Hodder (Jason) are going to be there, along with Lance Henriksen, Roddy Piper, Heather Langenkamp and countless other celebrities of horror. And there’ll be vendors and screenings and music and people wearing costumes and oh, there’s just no place like home. I’m going to do my best to be there and there’ll be a lengthy blog post to follow that up, maybe even with pictures. If you’re in the area that weekend, you should definitely check it out too. I’ve often been tempted with the idea to write scary stories tailored for an individual. A person’s fear is a very personal thing. What scares you might not scare me and vice versa. It’s hard to hit on broad stroke fears that will affect the majority of people. It’s the battle I always have with myself when I do write horror. I can go for the niche (noneuclidian horrors living in the space between space) or I can go for broad (man with stabby knife). The best I can do is try and scare myself and hope that works out ok. Unfortunately, one man’s soul searing phobia is another man’s walk in the park. But, let’s say you went to a website and you plugged in your greatest fears, your very unique to you fears: that dark space in the attic where the light never reaches, the demon that invades and possesses, the swarm of rats that lurks under every floorboard. You pay a fee and in three days there’s a story in your inbox that is designed only for you. And let’s say you can further customize the story. Gore turns you off, the supernatural is a big meh and you like serial killers. Long or short, violent or suggested blood, ghosts or killers; everything you need to really shake you.